I had a lot of "me time" this past weekend (since my sweet husband was busy working at the office Saturday and Sunday) so I took advantage of my free time and tested out some new recipes! Not only did I have a blast making a mess of my kitchen, but I was able to play around with three new recipes and could not wait to share this week's meal makeover recipe with you all! If you are like me (and human) you may crave pizza nearly 365 days a year, but you may not want the high-carbohydrate and high-calorie content of the traditional pizza! 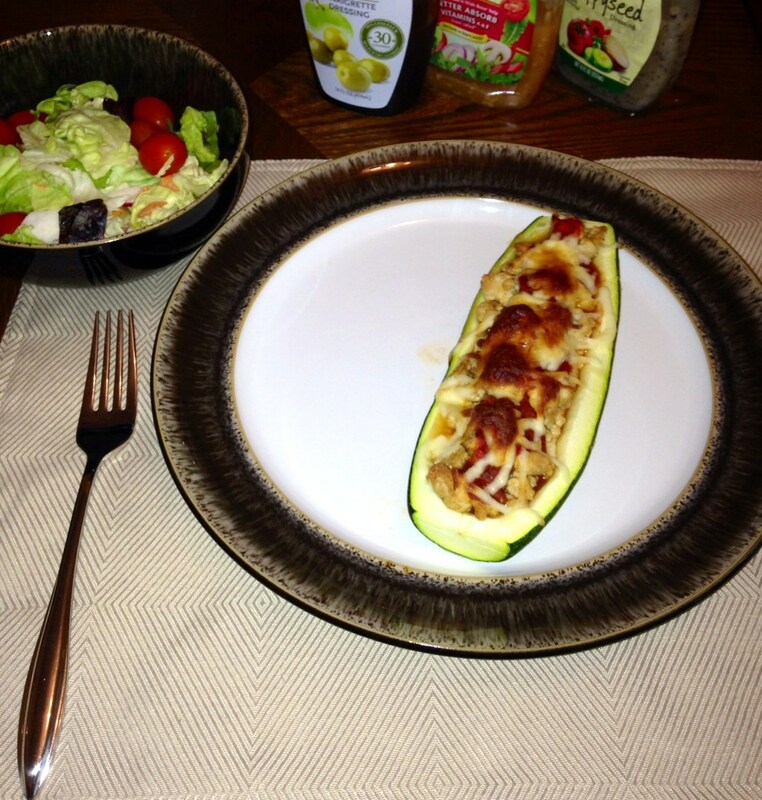 Have no fear, the Zucchini Pizza Boat has come to your rescue! This low-carb, high protein "pizza" is super easy to make and surprisingly delicious and filling (thanks to the water and fiber content of the almighty zucchini)! 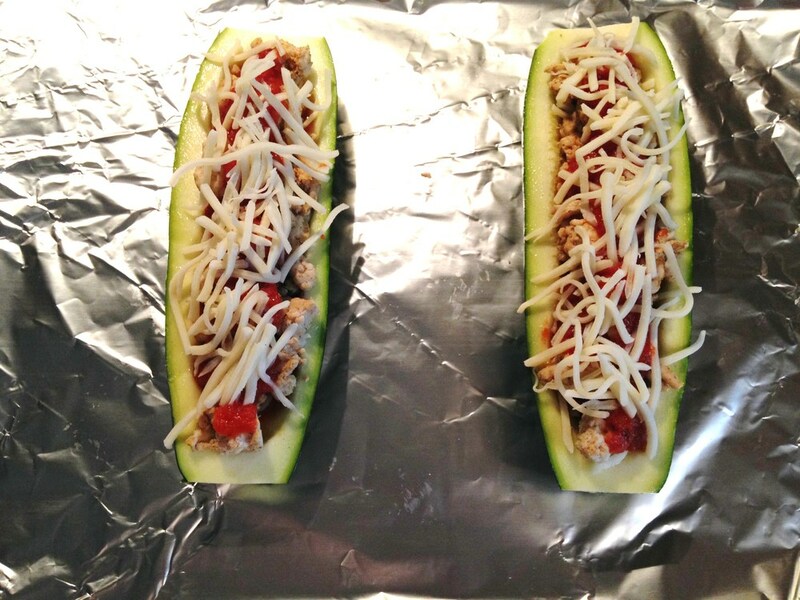 One serving (1 zucchini boat) provides you with nearly 36g of lean protein and a mere 13g carbohydrates and 6g total fat at only 245 calories. 6 oz cooked extra-lean ground turkey (divided) (I cooked 1.25 lbs of Jennie-O Extra-lean Turkey and saved the rest for leftovers). Preheat oven to 400 deg. F. Wash the zucchini well and dry with a paper towel before cutting the vegetable in half (length wise). Cut the ends off as well. Carefully scoop out the zucchini flesh and seeds with a mini ice cream scoop or spoon, but be careful not to press too hard and break the core of the zucchini. You want to leave about 1/4th of the zucchini flesh intact to make the "boat" shape for the turkey filling. Discard the zucchini flesh and seeds or save for later use in another recipe. In a large sauce pan, cook the turkey completely (no pink pieces left) and then add in the spices (cumin, chili powder, and garlic salt), remove from heat and stir in spices well. 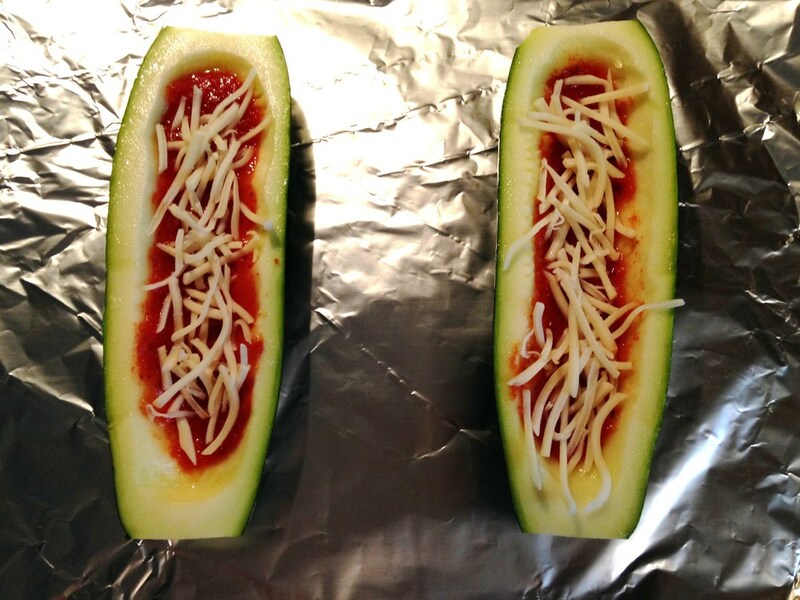 Line a cookie sheet with aluminum foil and place the zucchini halves on top of the foil (flesh side up). Fill each boat with 2 tbsp pizza sauce, then 2 tbsp shredded cheese, then 3 oz of cooked turkey, followed by remaining 2 tbsp pizza sauce. Bake the zucchini boats at 400 deg. F for 20 minutes. Carefully remove the cookie sheet from the oven and top each boat with the remaining 2 tbsp shredded cheese. I hope you will try out this meal makeover recipe and share it with your family or friends. Let me know what you think!